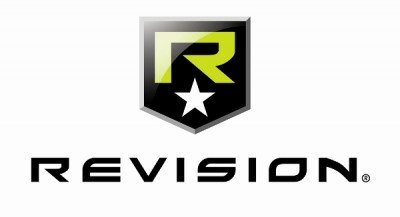 • Optional Rx insert is also compatible with Revision Sawfly Spectacles; Revision Eyewear offers Rx Carrier fulfillmentservices. Contemporary styling meets Revision-trusted ballistic protection and superior quality optics in this all new military eyewear system. 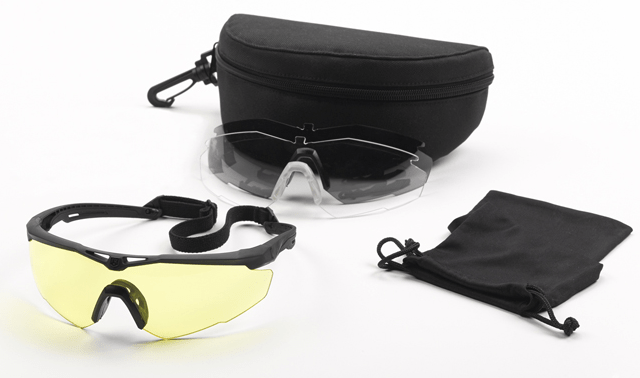 The StingerHawk’s high-impact polycarbonate lenses provide full side impact protection while maintaining distortion-free vision and an unrestricted field-of-view. Designed to complement a variety of Armed Forces’ helmets, this ultra lightweight spectacle features a compact, low profile design that delivers on comfort without compromising performance. • Thin temple arms guarantee the utmost comfort, equipment compatibility and stay-put fit. Slimline ergonomically designed arms and overmolded underframe provides shock absorption and grip. 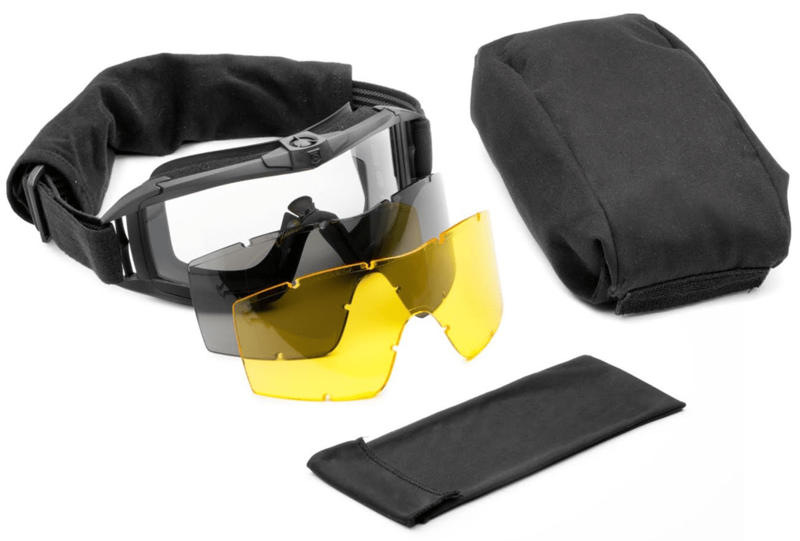 Optional Rx insert is also compatible with Desert Locust® and Bullet Ant® Goggles. Is the last day of Military 1st Sweepstake: vouchers to spend in our online store wait for 3 lucky winners. Go to https://a.pgtb.me/V5QdLn & enter your details now! 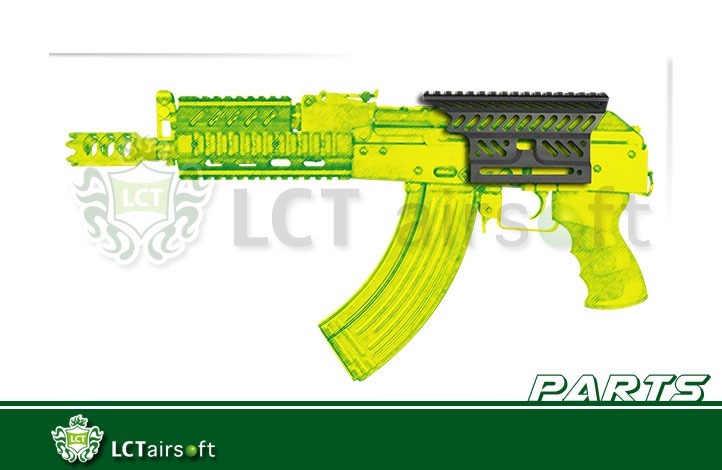 Hello Arniesairsoft, Tinywind is online outdoor sporting goods shop offering airsoft gears, LED Flashlights and Bike accessories etc. Halloween is coming! We are holding several events for airsofters, flashaholics and outdoor enthusiasts from Sep. 29th through Oct. 31st. Bob’s Rebel Training Camp at XZone in Chesterfield, VA is this weekend! Have you purchased your game tickets? There are still a few spots available. You wouldn’t want to miss this amazing event. 0241Tactical has A-TACS FG, A-TACS AU, and Multicam standard size pillowcase sets available for sale now at www.0241Tactical.com. 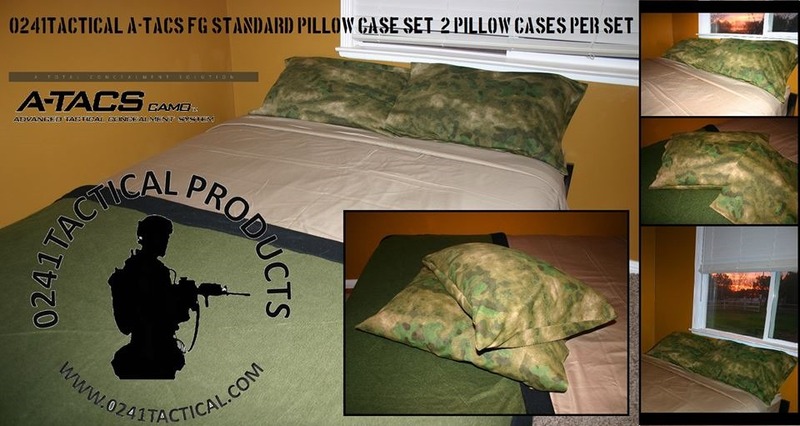 A-TACS FG & AU & Multicam Pillowcase (2 per set). Made from official Cotton Jersey A-TACS material & Official Crye-Multicam made in the USA. Standard pillow case is great for the diehard A-TACS user! Not mention is a little unique (you won’t find these in any store….unless they buy ours). Guy, decorate your man cave (that was a test if you man cave has pillows in it, it’s not a man cave) or take back the bed room one camouflaged pillow at a time. To celebrate eHobby Asia’s 10th Anniversary. From now to October, ALL ITEMS 10% OFF!! All buyer can get eHobby Asia 10th Anniversary Gifts. 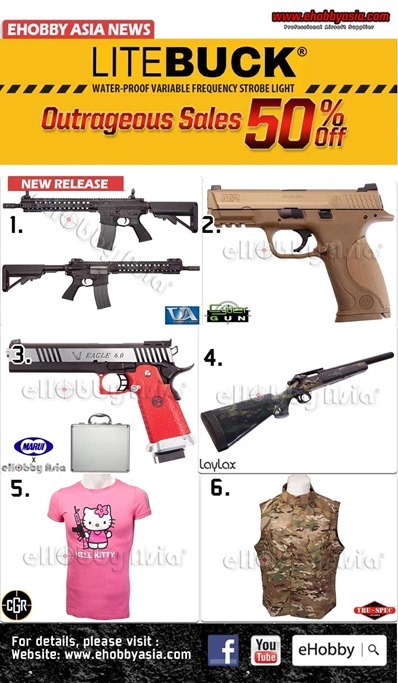 Cybergun Smith & Wesson M&P 9 (Dark Earth) and more@eHobby Asia! HOT: Cybergun Smith & Wesson M&P 9 (Dark Earth) and more @ eHobby Asia!! These nozzles allow you to adjust the FPS of your BBgun easily, precisely and give a very stable velocity from 280 to 390 FPS without adding cooldown (these values were measured using 0,2g BB’s, propane gas at 20°C, these values are given for information only and can vary from a BBgun to another). Velocity adjustment is made without any disassembly, directly through the ejection port. Today’s video… "Horsemen Of The Knight" are an equestrian stunt team. They feature at many game fairs and shows round the UK. Here is some slow motion of them in action. A light hearted, yet impressive display. NOTE: I own the commercial and non commercial rights to the audio. Music by Johobo2 on Newgrounds. Ares Armor 80% Signature Lower Receiver. AR15 and AR10. The operations remaining to complete the Ares Armor 80% billet receiver are: (1) Fire Control Group, (2) Trigger Pin, (3) Hammer Pin, (4) Trigger Slot and the (5) Safety Selector Hole. This is a not an FFL item. This is not a complete lower receiver. This product still requires machining. These 80 percent AR-15 and AR-10 lower receivers are fully machined from 7075 Billet Aluminum. Ares Armor signature billet is easy to identify – look for the III (3%) logo by the mag well. Product is designed and made in Oceanside, California. Quick sneak peek of the highly anticipated Amoeba AM-013 "MRE" – Modular Rail / Experimental. Stay tuned for full review! Being A Man Might Seem Like A Scary Thing, But It’s Simpler Than You Think! The A&K M249 SAW is a high-performance SAW [squad automatic weapon] that is notorious for its perfect balance between affordability, performance, and reliability, with no compromise in between. The M249 SAW is a full size replica of the real steel M249, and is built using high quality materials outside and in to ensure durability, even during extended game play. This month on RedWolf TV, Tim will be introducing a few new AEGs from G&P, the G&G GM1903 A3 and GSS Vintorez, the Umarex HK417 GBBR and the Shoei MG-42 EBB! YouTube video maker in Scotland, over 150 MILLION hits. Christmas has come early & S-Thunder (www.s-thunder.com) is pleased to announce that it is having a special customer appreciation SALE starting October 1! 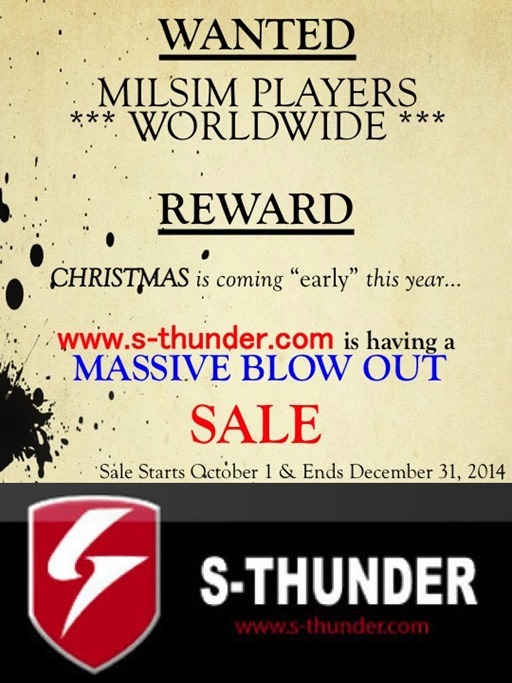 Stock is limited so start checking off your S-Thunder Christmas wish list! LPE 16mm to 14mm CCW thread adaptors are designed to allow the use of widely available 14mm CCW threaded silencers on 16mm threaded pistols such as the KSC/KWA/Umarex USP Tactical, Mk23 SOCOM, Tokyo Marui Mk23 SOCOM fixed slideand KWA Kriss Vector. 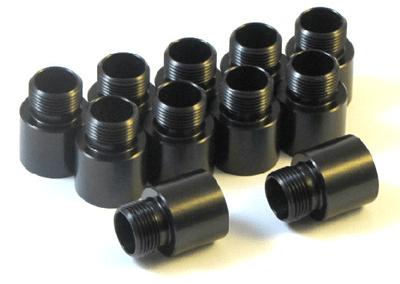 Each adaptor is fully CNC machined from lightweight 2014 T6 aluminium with machine cut threads, anodized in black. Trade prices are available for retailers worldwide, please contact for a trade price list using the contact form on the website. The Madbull XCR-FAST, which stands for “Fully Adjustable STock” can be quickly deployed from the folded position by the push of a strategically placed button and flick of the fingers. It locks firmly into the deployed and folded positions. It can be adjusted so that any user using any sight can be perfectly comfortable. Our stock is light at approximately one pound. It is very thin at less than one inch in width. Folded it creates a tight, compact package. We designed this to work with all your gear, be it face masks or goggles. No tilting the head necessary for seeing your sights. Fastest sight acquisition time possible. The fully adjustable stock can be configured so that any user can be comfortable with any sight or optic. Madbull is known for making the highest quality licensed products and the XCR-FAST is no exception! Tactical Kit now stocking a range of Reebok tactical boots. Now we released the following items….. 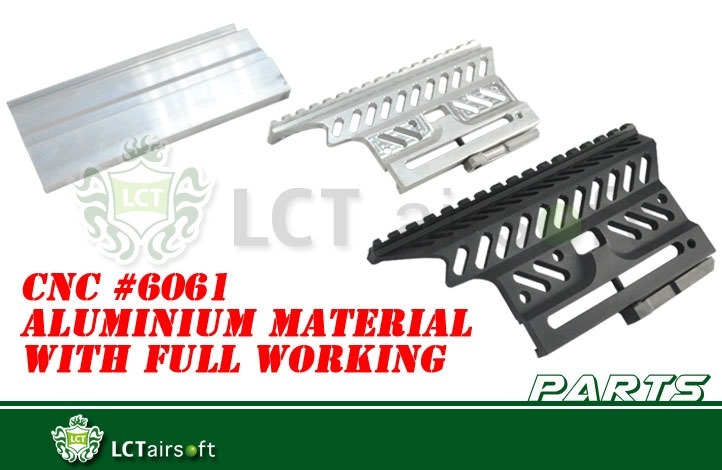 It is made of #6061 Aluminium material with CNC full working. It is made of steel material with CNC full working. 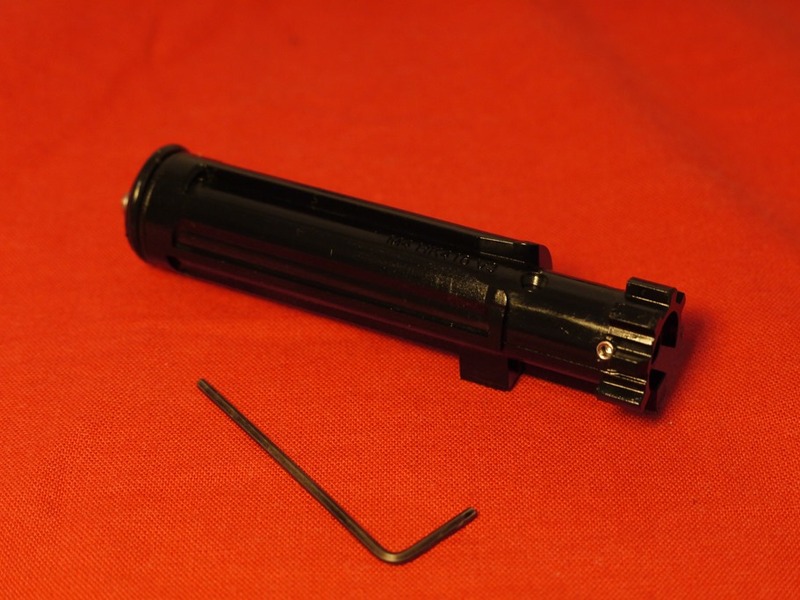 Suitable for all the LCT models with 14*1.0mm (L) flash hider. 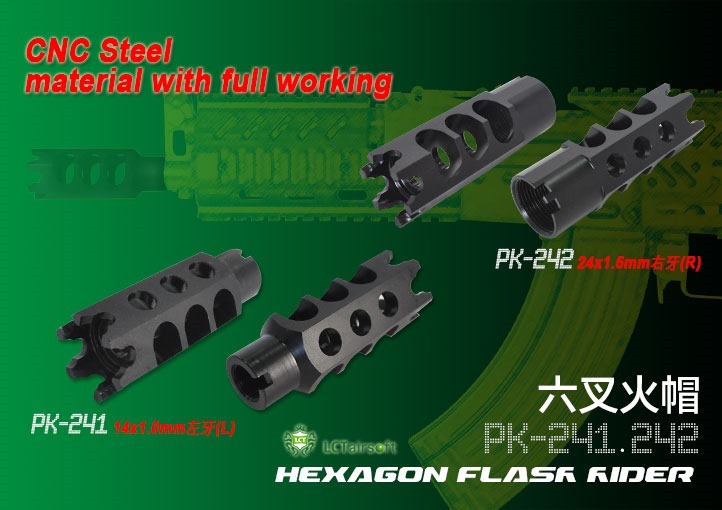 Suitable for all the LCT models with 24*1.5mm (R) flash hider.